T he shirt was hand made in England; naturally it's of outstanding quality. excellent overall condition: initial impressions are that it's without flaws, but close scrutiny reveals a small faint mark to the back (photo 8); there are also small faint marks beneath the belt line and inside the fold of the double cuff, and a little very light discolouration inside the collar - these minor 'issues' will all be invisible during normal use (photos 9 and 10). 23" = Sleeve length (from shoulder seam to sleeve edge). 17" = Shoulder (Seam to seam). 36" = Shirt/Tunic length (from nape of the neck to seam). 15" = Collar. All UK mainland parcels cost £14 up to a maximum of 20kgs. This pale grey collarless shirt has never been worn and is still pinned. It has its original cardboard backing and plastic covering. 2 detachable collars included. The shirt is pale grey.the blue on picture 2 is where it is overexposed. 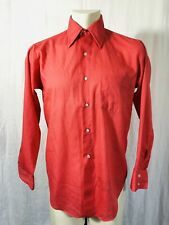 Vintage Rare 1950-60's Archie Brown Bermuda Dress Shirt UK Men's 14 1/2 34 S/M. Shipped with USPS Priority Mail. True vintage and extremely rare. Handmade in England for the Archie Brown Bermuda shop. It is pre-Archie Brown and Sons label placing in 1950-60's. Minor wear and dirt but in good condition. 14 1/2 34. Small to medium. Please heed measurements. Pit to pit 21", length 31"sleeve from armpit to cuff 20". Nylon Dederon. 70/80er DDR. Shirt Chemise. It features a fused Lansdowne style collar by Tex Craft which is trubenized and needs no starch, glass buttons on a reinforced placket, rounded cuffs, side gussets, double stitched seams and a nicely designed single pocket. New Old Stock W Cardboard Inserts - New & Unused. Clean w no damage or any issues but for a small minor light dirty spot at R lower sleeve - this should hand spot wash or launder clean when you see fit. No age discoloring or discoloration from cardboard insert. *See Full Description*. Vintage Art Deco Marcella shirt by Horaces, Angel Court, Throgmorton Street, London. . The shirt for sale is a vintage men’s collared Disco shirt made by Mohawk. This shirt is a men’s large and in good used condition. The only flaw with this shirt is that it is missing 2 buttons as shown in the pictures. Please ask me any questions prior purchasing. A vintage Marcella evening shirt, probably made in Edwardian times or in the 1910s.This is a collarless "grandad" tunic shirt (it was worn with a separate collar, either Marcella or starched, which would have been held in place with a pair of collar studs). Eichsfeld Konfektion. aus originaler DDR VEB Produktion. out of original GRD VEB production. Aus weicher Baumwolle. Grün-Braun-Weiß kariert. Hat zur hälfte Knöpfe und ist unten geschlossen. green-brown-white caro pattern. Vintage Joblot of 30's Austin Reed RAF Summit Shirt with 10 Collars XXS 13"
This is a lovely collection of RAF Collars & Shirts. One is Austin Reed Summit and it's in good condition collar size 13". A total of 10 collars a couple of different sizes mostly 13" 13.5". Langarm - Oberhemd. Kragenweite:41 ( entspricht Größe L ). Zustand: neu mit Etikett. VEB Zentralwirkerei Limbach. made in GDR. hel 02.02.18 KE. made in DDR. original 80s. blue with red-white blurred stripes. 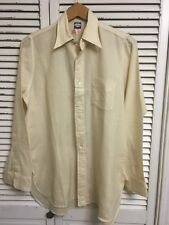 Men's vintage Raymond Stuart Deluxe shirt by Spence Bryson. Made in England, probably in the 1970s or thereabouts. Blue. Rocola Pall Mall starched Marcella tunic shirt for formal wear. .
Auctiva's FREE Counter. These include Isle of Man, Channel Islands, Northern Ireland, Scottish Highlands, etc. 100% Cotton. NO HOLES OR ODORS. TOP TO BOTTOM 33. SLEEVE 23.5. OLEG CASSINI. DISCO SHIRT. Silky Nylon. Various, Multiple BIRDS Print. a pulled or loose thread, a missing sequin or bead, signs of machine washing, etc. Small stains can often be removed with a little Shout & hand wash, cold water drip dry. 9 Vintage 1930's Mens Detachable Shirt Collar. Size 13.5.Cotton. Okinawa, Japan by Gilt Edge. Six button front, cuffed sleeves. Note that ironing may be required upon arrival. double chest pockets. Chest (from pit to pit): 21 1/4". original cardboard insert. Body may show a few pinholes from original. Maker label: PERLIE 🐚. Super cute 100% silk top with polo horsey photo print, super rare and crazy cute. Shoulder seam to shoulder seam 17”. English laundry shirt White Blue Stripes 16 1/2 32/33. Condition is Pre-owned. Shipped with USPS First Class Package. Das Hemd befindet sich in einem guten getragenen Zustand. Nike Air Blazer Polo T-Shirt TShirt Sneaker Turn Schuhe Trainers Grau Grey Gr XL. Adidas Bologna Fussball Schuhe Soccer Shoes Leder Football Cleats West Germany 9. It is light blue with repeating log cabin, locomotive, and landscape graphics. The shirt has a straight collar, is button front, is long sleeve, and is 100% polyester. This rare button down shirt is a silky poly, with an amazing floral honeycomb print. - It's cheaper, and. It's responsible. Cuff are made for cuff links, and a slight tapered fit. Fold over collar, no pockets and rounded hemline. Its not new its a antique item. But for its age it displays very nice. It will make a great conversation piece. I try to give the best info I can. POIDS NET DU LOT 500 Gr. Largeur épaules 50 cm, tour de poitrine 114 cm, longueur des manches depuis le bord de l'encolure 83 cm, longueur dos depuis la base de l'encolure 75 cm. TAILLE L (COMPTE TENU DU TOUR DE COU). Kurzarm, Sportkragen. im Vorderteil Kragen wirkt die Farbe etwas kräftiger, weil dort der Stoff doppelt ist. Chemise, Shirt. Great old NOS shirt. Has price tag still attached, looks to be long sleeve but is in original pinned condition. Yellowed with age.